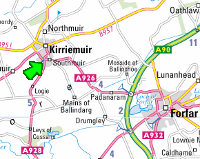 Kirriemuir Briquette & Boutique Log Company started as a subsidiary of David Petrie Joiners Ltd, with a small briquetting machine to help the environment, by using the wood waste from our manufacturing workshop. Kirriemuir Briquette & Boutique Log Company has now grown into its own company; we are a family run business having been in the Angus area since 1977. Due to a passion for briquetting and recycling we are always on the lookout for materials to use, to create the best possible product to burn, using our state of the art machinery. We currently source our raw materials locally and this now enables us to produce wood briquettes as well as kindling. No trees are directly felled for supply. We also sell locally sourced hardwood, which we process into seasoned logs that have been barn/air dried. We do not import from overseas & our plastic bags are 100% recyclable. 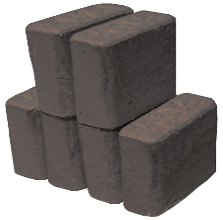 Wood briquettes are an excellent choice for fuel, not only due to the low CO2 emission levels, but also because they are a wood-based fuel type, which can be a very economical means of providing heating. The chart on the right shows some indicative figures from the Nottingham Energy Partnership (www.nottenergy.com). These figures are based on fuel prices from suppliers in the Midlands from 2014 and are subject to variations. Nevertheless, they clearly show that wood is an economical choice as fuel. 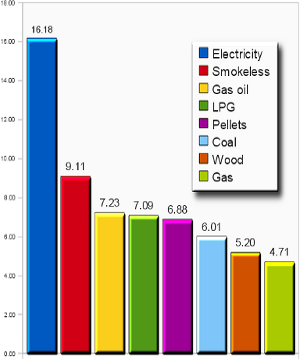 The second chart on the right shows the overall emission levels for various fuel types. 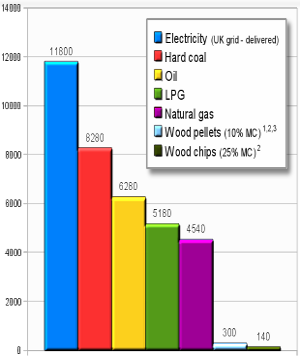 Wood pellets and wood chips show a significantly lower amount of emissions compared with other fuels (data source: www.biomassenergycentre.org.uk). "Wood-fuel heating systems can achieve significant reductions in total emissions of greenhouse gases. While CO2 is emitted when chips, pellets or logs are used in wood fuel heating systems, an equal amount will have been absorbed during the growth of the trees - hence their 'carbon neutrality'." The above quote is taken from the SDC Biomass report - Wood Fuel for Warmth document. Further information can be obtained at www.sd-commission.org.uk. It is worth noting that the transport factor only really affects the collection of the goods, by the end-user, since transport to our production premises is offset by transport, which would otherwise have to be incurred on going to landfill or other disposal method. What goes into our briquettes? 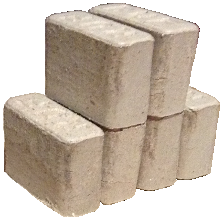 Our wood briquettes are produced from off-cuts and by-products of joinery and milling operations. These raw materials are sourced locally and are of classes A1 and A2 per BS-EN14961-3 for virgin and chemically untreated wood, making them an excellent choice for clean burning as fuel. The raw material used is wood waste which would otherwise have to be sent to landfill or some other method of disposal. No trees are felled directly for our production, since they have already been felled for the milling and joinery operations. and in particular, the work by M. K. Misra et al. "Wood Ash Composition as a Function of Furnace Temperature [PDF]". "Modern woodfuel systems burn very cleanly when carefully controlled to ensure complete combustion, producing small quantities of ash, emissions and little smoke. The ash (typically less than 1% of the wood input, by volume), is not classed as a hazardous waste and can be disposed of with relative ease, for example for use as a fertiliser or as a raw product for block making in the building industry." from the Commission's Forest Research unit 2006 publication titled "Woodfuel meets the challenge". 1 Starting from dry wood waste. 3 These figures for wood pellets include the hammer mill and pelleting process, however do not include sourcing the feedstock and any pre-processing such as drying. If starting from green wood then drying could be a very major component, however pellets are often made from dry waste wood that has been dried for another purpose, such as joinery. These figures also do not include transport (which is included in the figures for wood chips).